An elderly monk, while training the young novice who will succeed him, recalls the mysterious lost love of his past - just as his young successor appears to be encountering her himself. A chance encounter, a juicy yellow lemon and an unfortunate twist of fate will reveal that the symbiotic relationship between people is inextricable. I first saw this movie in the Spring of 2001, and it is truly one of the best films I have ever seen. 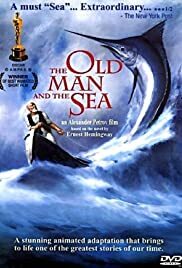 Mr. Petrov not only does a magnificent job of depicting the story of the Old Man and the Sea, but also gives tribute the life of Ernest Hemmingway in a way that is true to the man. I still remember many affecting lines from Hemmingway's journal that are included in the movie (though not verbatim, otherwise I might leave some here). I left the theater with a changed perspective on life and its importance. Needless to say, I would love to be able to see this movie again. However, because it was in IMAX format in theaters, it has never been released on DVD or VHS, at least to my knowledge it hasn't. I hope someday the means will be provided to release the movie in a format for private viewers to purchase. That day may never arrive though. Thus, if you ever have the chance to see this movie in an IMAX theater, don't let it pass you by!